Aimee Hertog. Cocoon, 2016; wall sculpture measuring 22" x 12" x 4". Melissa Eder. 'Can You Dig It? A Chromatic Series of Floral Arrangements (Pucci), digital print on metallic paper, 30" x 40", 2014. Melissa Eder and Aimee Hertog bring "Fleur (Essence)" to the Lazy Susan Gallery at 191 Henry Street on August 29th, following its debut at the Satellite Art Fair during Art Basel Miami in December 2016. 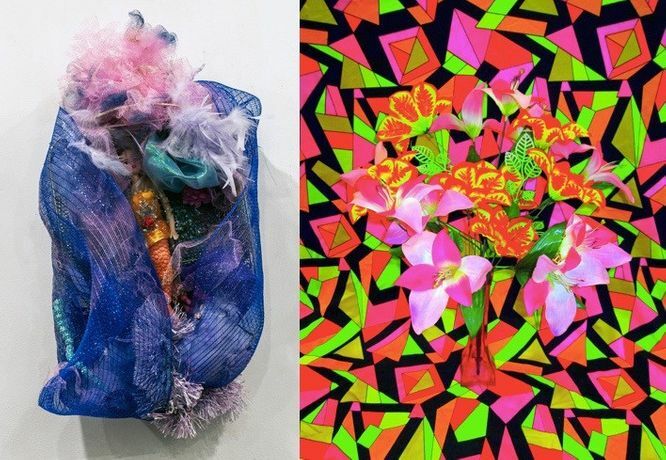 "Fleur (Essence)" is an ambitious, playful, and wildly colorful collaborative installation that integrates mixed-media, assemblage and photography in an accessible, open-space context that explores the notions of kitsch along with the unexpected beauty of ordinary objects. Eder’s photographic and ephemeral reproductions, for instance, depict merchandise found in 99-cent stores while Hertog displays her signature sculptural assemblage works fashioned from the detritus of her daily life. Hertog manipulates discarded clothing, Styrofoam, and shredded paper, transforming throw-away materials while other items such as fragments of fabric, dead flowers, and broken glass are left untouched, in their raw state. Eder will display her large-scale photographs from "Can You Dig It? A Chromatic Series of Floral Arrangements," an evolving group of photographs that portrays an array of floral arrangements using fake, plastic flowers. Further blurring the line between high and low art, Eder uses a low-tech camera and simple lighting, challenging the definition of a well-crafted photograph. Her photographs strike a comparison between the concepts of natural versus artificial, and what is considered beautiful or deemed distasteful. Using kitsch as its primary point of departure, "Fleur (Essence)" is a motley, engaging, and vital space in which to contemplate the nature of beauty.